Would You Turn Down A $300,000 Pay Day For A Grappling Match? 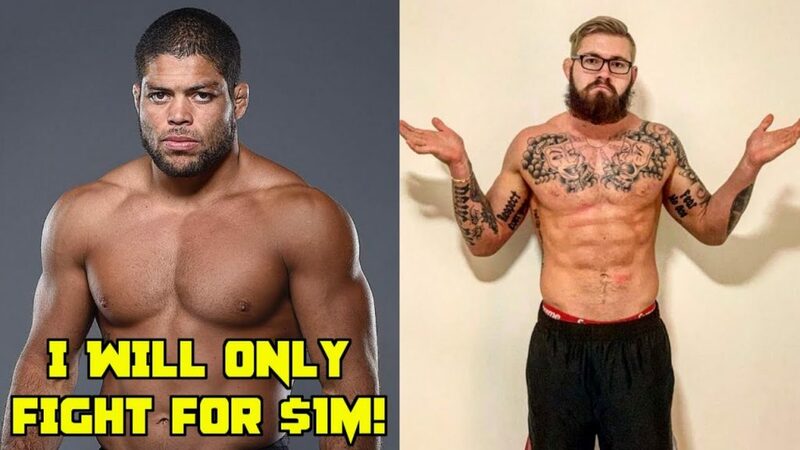 Over the weekend, Andre Galvao gave an off hand comment about Gordon Ryan, and in doing so set in motion what could have been the biggest money fight in grappling history. Initially, Gordon challenged Andre for $50,000 in a winner take all match up. Galvao turned it down, and Gordon raised the stakes to $100,000. That in itself would be the biggest publicly disclosed payday in grappling history. The ADCC World Championships pays out $50k if you win both your weight class and the Absolute division (winning 8 matches against the worlds best), although winning the super fight gets you $40k, and with it being only one match, is a better value. It is rumored that Metamoris was paying out close to 6 figures to top athletes, but none that have been verified to my knowledge – not to mention a lot of bounced checks. Nevertheless, Galvao turned that down too. Then Josh “Star Lord” Leduc stepped in and offered to promote the event and pay out $300,000. Wow! That is a lot of money – even in the MMA world. Yet Galvao turned that down and countered he would only fight for $1,000,000 dollars. Some people are arguing that Galvao had successfully raised the stakes twice by his persistence at getting more money, and he is trying to push it to 1 million. Others are saying that he is scared, and is just giving an unrealistic number so the match could not happen. I have no clue what’s going through his head, and I wager no one except him knows. But, I personally think it is silly to turn down that type of money for a grappling match. Some people are saying Galvao is retired and has nothing to prove, yet he is competing in ADCC later this year for $40,000 (for his retirement bout). So why wouldn’t he compete for 7.5 times more money? Suppose money means nothing to him (which I doubt is true if he was asking for a million) and we forget about the money for a moment. Just the fact that he would be part of a historic match should be very enticing. It would be the biggest payday in grappling history, that might trigger more big money fights for other top athletes. Unfortunately, it doesn’t appear like the bout is going to happen now. But we would have to wonder if it could have even been possible to pay out the winner at $300,000 too. From what I have seen and heard, grappling doesn’t fill up stadiums, or even high school gymnasiums for that matter. So it would have to be the PPV that would cover the expense. Most events I have seen charge between $10-$20 for a grappling stream, and while I cannot attest to what type of numbers they pulled, from what I have seen of free streams of big match ups on Facebook Live, they wouldn’t even have enough free viewers to cover the cost, assuming every free viewer would pay $20, which is very unrealistic. It would require some angel investors or sponsors to be able to cover the costs, which is more than likely how I think they got to $300k. Even still, they would probably not get a return on that investment. But, one cannot account for the hype factor of this match, and Gordon has proven he has a great hype game. I haven’t paid for a grappling PPV in a long time, but I would for that match, which we haven’t even talked about how it would stack up skill wise (I think it would be an excellent match). So as a fan, I’m disappointed. Even as a competitor it’s a let down. I want to see these grapplers get paid serious money, and this would have been an opportunity to do that. Hopefully, he’s doing it for the right reasons and will eventually accept, because it seems like a win/win for everyone if he does, regardless of the outcome. Its usually they dont need the money or dont want to get beat.Either it could be both too.It would have been a good paycheck. BIG EGOS ARE CARRIED BY SMALL MINDS AND BIG PRIDE !! !